KNIGHTS ARMAMENT SR15 AMBI LOWER RECEIVER W/LMT 6 POSITION SOPMOD STOCK. IN STOCK NOW! CONSECUTIVE NUMBERS AVAILABLE. $795 shipped on a card, Add $100 for Black SBA3 Brace if needed. These are 100% completed Knight's SR15 lower receivers and are registered as receivers only, you can make a pistol, rifle , or SBR out of them. 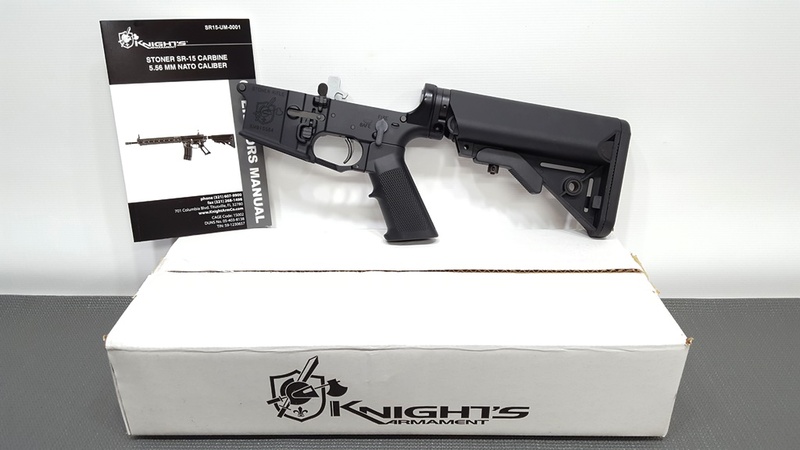 They come with the new ambi controls and Knights 4.5 lb match grade trigger and the same LMT SOPMOD stock as on all the Knight's SR15 rifles and ship as a RECEIVER ONLY! These would make a nice pistol armbrace conversion, or build your new rifle on one. There are consecutive numbered lowers available upon request, just ask. Knight’s Armament designed this system to give shooters the maximum amount of options in their controls. Under this design all of the weapon’s major controls can be accessed from either side of the lower receiver. Left-handed shooters see the immediate benefits of being able to access the weapon’s controls in a more intuitive manner; however, there are a number of other benefits that right-handed shooters will enjoy under this system. Competition shooters benefit from these controls from the increase of speed that is achieved through components such as the right-side bolt catch. Trainers enjoy the variety of options because they can watch their trainee from either side of the weapon and even manipulate the weapon’s controls from the non-operating side. KAC has also introduced modifications to the design such as the scalloped safety selector switch. This allows a lower profile for the selector switch on the non-operating side of the receiver which helps to relieve any interference between the switch and a shooter’s glove or hand. For the maximum amount of configuration and operation options, Knight’s Ambidextrous Controls offer a sure solution. The first stage is a ‘no-poundage’ stage where hardly any resistance is felt during the rear-ward squeeze. There is a center point at which point resistance is felt and the second stage of the trigger begins. At this point, 4.5 pounds of force is required to squeeze the trigger through the second stage and cause the weapon to cycle. Our 2-stage trigger is meant to inform a shooter of exactly where their weapon is going to fire. This bolsters a firer’s confidence and can also assist in reducing trigger jerk, thereby increasing accuracy. The 4.5lb 2-Stage Trigger from Knight’s Armament is a highly calibrated and smooth component that is sure to be a welcome addition to any setup.